Just today BFG has entered the game and will be featuring some great prizes. There’ll be BFG shirts for the first 100 attendees plus tons of swag to share including. Remember … You can’t win unless you register. Those who pre-pay for the event get yet another chance at winning great door prizes, now in the thousands of dollar range. We have not only one grand door prize, but TWO! Get signed up today and hang on tight for another great Warfactory event! Planning to Attend Warfactory 2008? Please Register! If you’re planning to attend Warfactory 2008, please sign up today! Tournament events are expensive to run and require a lot of planning. For this event in particular, we know that a LOT more people are planning to attend than have signed up. While it may seem easier to you to wait, without knowing how many people to plan for we will begin downsize to save the expense of unused equipment. What this means is simple. First, there are fewer seats so you may arrive to find there’s no room left at the event. Second, with a combined total of $4000 in cash and prizes for our tournaments and perhaps $2000 more in great swag from Computer Geeks, FPS Group, Bawls, Thermaltake, and more, you stand the chance of missing out. Receive THREE door prize tickets!!! If you remember previous events, realize that we always give away a “Grand Door Prize”. Right now, items are work $250 or more. We want to have the best event possible and knowing who’s coming will ensure that we can do just that. Pre-paying also saves you $10 off the at-the-door price, so hey … it’s a win-win for everyone! Click here to sign up now or follow the “quick sign up” instructions you see in the previous post! We look forward to seeing you on the 25th! 2 – E-mail this list to dave DOT derington AT warfactory DOT net. 3 – When you receive an e-mail from Dave, you can then submit a single PayPal payment for your entire team. This process should make it easy for those of you with 5-man teams to avoid individual sign-ups! Happy October Everyone! Thanks to the efforts of Chris Moncivalles, we have an important announcement to make and are opening a brand new tournament for this event!!! BenQ, a leading provider of gaming LCD monitors & Projectors, has graciously agreed to sponsor the BenQ Quake 3 Challenge at Warfactory 2008. With the release of their new line of full HD 16:9 2ms LCD’s, BenQ has agreed to provide the following prizes for one of the last Quake 3 US events for 2008. Furthermore, BenQ is offering two $40 off promo codes (Promo code “E2400HD” for E2400HD, and E2200HD” for E2200HD) to all Warfactory gamers who are interested in pre-purchasing E2400HD and E2200HD on its online store at http://store.benq.us . Already hosting a $3,000 Counter-Strike 1.6 Tournament and an unofficial Call of Duty 4 event, Quake 3 should help make this a well rounded event for all to enjoy. Warfactory 2008, to be held on October 25-26, 2008 at IT Enterprises in St. Louis, MO should be a great fun filled destination for all Midwest gamers. To make sure that spectators can enjoy the action from their home if they can’t make it to the event, matches will be broadcast via GTV at benqtv.takingbackesports.com:27960. For more information about Warfactory 2008, please visit the official event page or to register for the BenQ Quake 3 Challenge, please visit the registration page. It’s official, we have our first major sponsors for Warfactory 2008! We are opening the gates to event registration today and encourage you to sign up and pay for your reservation. We’ll be offering $3,000 for CS 1.6 at this event, sponsored by Ranken Technical College and Dust-Off! We are now going to have an “unofficial” Call of Duty 4 tournament with some prizes and other tournaments may be added so please keep watching! FPS Group, Computer Power User, UMSL, and others are joining us daily to make this a fantastic Midwest event. We also have just returned from helping run ESWC at NVISION a couple weeks ago, so our skills are sharp. Running events for many hundreds of the best competitors from around the world was a blast; in the process we have earned national and international respect for our ability to administer gaming events. We have PLENTY of space for this event and will open the gates for ~200 users. CONSOLE AND PC gamers alike are welcome to attend … this is 100% BYOC (Computer or Console). Details will be provided on each registration page. Thanks everyone … let’s make this yet another fun and competitive gaming event! Warfactory 2008 – October 25-26! E-mail or post in our forums with your interests for tournaments. Contact us if you’re interested in volunteering to work at the event. Remember, our events are YOUR events. We have a long-standing legacy of both solid competition and fun for those who merely want to come and game. Feel free to e-mail or post your questions! We can’t wait to get back to doing what we love most – running fantastic events. Registration will open as soon as possible! Stay tuned!!! Many have asked, so we’ve uploaded our photos and created a page of all the winners. Please click here to see all the results! We’d like to thank everyone who came for supporting Hazelwood Central to support the Renaissance Program and Warfactory. 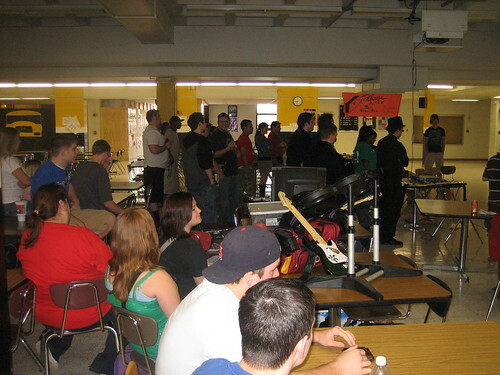 This was our first Rock Band event, and you can be sure we’ll continue to develop more opportunities soon so stay tuned! Rock Band Tournament Final Notes! Please note you’ll save $10 by paying in advance for this event ($30 in advance, $40 at-the-door). You can pay through Midnight, April 16th or if you’re a student at Hazelwood Central please contact Ms. Schoene. Most DLC is available, particularly for those who’ve requested particular songs. Please come to the main entrance of the Hazelwood Central building, enter the building, and turn right. We will be in the Main Commons area. Thanks, and see you all there! Rock Band Tournament at Hazelwood Central! Attention aspiring Rock Band Pros! Warfactory will running a fundraiser event for Hazelwood Central High School in St. Louis on Thursday April 17th, 2008. This event is open to the public! Click here registration and prepayment! Summer Event Series 2008 Announced! Posted in: News. Tagged: LAN Parties. Today, we’re making our first announcement of our “Summer Series” of events in partnership with Luke’s Game Space. If you’re looking for some great competitive events, we will be having something for everyone … from Counter-Strike 1.6 and Source, to Call of Duty 4, to Halo 3. Both PC and Console events will be held. We are checking our calendars over this week and will announce our first few events soon. Our hope is to begin in April/May and continue all the way through the end of Summer. Instead of one single Warfactory event, we believe that smaller and more focused events will make for much stronger competition and a lot more fun for everyone. For those of you who came to our first event at Luke’s, please note that we used that event as a “pilot” and will be making many changes to the facility to make bigger events easier and much more fun. We will separate our PC and Console events so we can allow for larger numbers of attendees and will be rearranging things so you can get around easier too.